When I give nutritional recommendations to a client I always recommend they prioritise protein. Protein is so important for overall health, muscle repair and retention and feelings of fullness when dieting, but in the UK we don’t eat enough of it. The amount of protein we need varies depending on our activity levels and body weight (the calorie and protein calculator on my website is a good place to start-link below) and you should look to include protein in all meals otherwise you’re playing catch-up throughout the day. 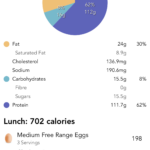 You may think that I’m talking about eating piles and piles of meat but I’ve added some basic high protein foods to Lose It and you can see how many calories and grams of of protein this equates to. 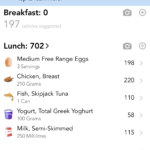 Have eggs for breakfast, tuna at lunch, chicken at dinner and have the yogurt in a snack. These are simple foods to build meals around and it’s up to you how you make up the rest of your days calories. This may seem like basic advice but having seen many food diaries it’s easy to start the day with toast and a coffee or tea, grab a pasta salad or soup for lunch and get to dinner having consumed very little protein. Do this on a regular basis and your immune system will be compromised and you’ll lose muscle mass. Let’s work to getting the basics right to improve your general health. Next Post Nutrition Tip – Hydration for health and performance.